I heard the news of Ahmed’s* death over email. 24 years old, he had been deported from the UK, his home of eight years, in the days before. I had received an email from him in which he warned me that he “could be dead” accompanied by a scanned copy of his Home Office deportation order, a suicide note of sorts. A colleague responded to my concern with the devastating news: “sadly I believe him to be dead. He had been completely let down and ground down by this country”. The final words Ahmed said to my colleague were haunting, "I have been released forever". The news of Ahmed’s likely suicide followed an email that I’d received earlier in the week from another colleague which documented the suicide attempt of another young migrant. It has left him hospitalized for the second time in weeks. Meanwhile, Bilal* a successful engineer who grew up for most of his life in Britain tells me that as he awaits the outcome of his asylum appeal that could see him deported to a country he barely knows he has started to cut himself with a knife. Self-harm, anxiety and depression are well documented among migrant refugee populations as a result of past and present traumas, yet I hadn’t anticipated this kind of occurrence in my University research ethics application when I began my PhD. Quite simply, you don’t expect your research participants to die, and especially not if they are youth or children. Responding to the ‘reflexivity’ we as researchers are encouraged to display, I sat down on the floor of my home and I wept. I wept for Ahmed’s life and for the family who – having been multiply displaced in Afghanistan’s ongoing war – would not even know to mourn for their son. Home Secretary Theresa May who this week announced her leadership bid for the direction of the Tory Party and our country has been at the helm of this moral devolution. And in the coming months and years, her election could usher in the so-called “hostile environment” writ large. 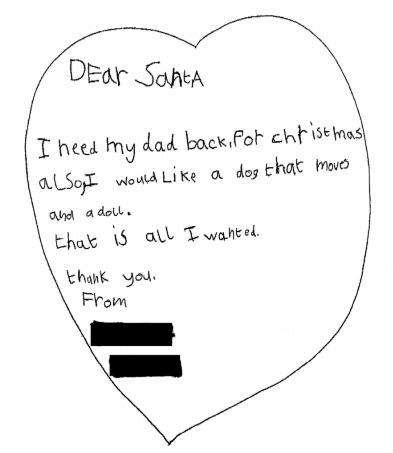 Letter by Sylvie, 8 years old written while her father was in immigration detention. Source: BIDYarl’s Wood immigration removal centre, marred by scandal, stands as a legacy of May's enduring obstinacy and devastatingly cool composure in the face of human suffering. Moments of empathy pierce this landscape on the part of bureaucrats who have been implementing May’s new regime. At an asylum tribunal in 2015 a Home Office representative expresses grief to me over the suffering of a child who was paralyzed when a lorry ran him over on the M40. He’d just escaped from the truck in which he had been smuggled when it hit him. “They’ll build an underpass for badgers but not asylum seekers”, he tells me. “Poor guy”. Having argued passionately for the deportation of a refused asylum seeking teenager fearing FGM, another Home Office official whispers to me, “God, I’m glad it’s not my daughter”. Bureaucrats outside of the immigration system are also uncomfortable with the shifting tone of the debate ushered in by May and largely uncontested by her political peers. Landlords are weary of being coerced into racial profiling of would-be tenants, and University Professors lament having to police their foreign students like proxy border guards. For May’s One Nation is one with rigidly policed boundaries and borders that cut right into the private lives of its citizens. Rob Lawrie may have been spared jail earlier this year for his “crime of compassion” in seeking to reunite a Syrian refugee girl with her family in Britain, but the ordeal, he commented, “has ruined my life”. The stress of the trial and consequences on his own family life drove Rob to attempt suicide. It’s a deterrent to the most soft-hearted of us who seek to do the right thing in a system that feels at times to be so deeply wrong. May’s stubborn reign has cost us multiple freedoms and marked an unprecedented attack on civil liberties, most commonly referenced in relation to the so-called ‘Snooper’s Charter’. But it is Article 8 of the much beleaguered ECHR – the right to family and private life – where her most enduring legacy lies and will no doubt grow in the coming years if she can weather this final storm. In her 2011 speech at the Conservative Conference, she launched her attack by declaring that the right had been ‘perverted’ before seeking to bully the courts into reducing its effect through parliamentary pressure and the 2012 Immigration Act. “In the interests of the economy, or controlling migration or public order, those sort of issues, the state has a right to qualify the right to a family life” she asserted. Remember, human rights were then reduced to #catgate for a while: "We all know the stories about the Human Rights Act... about the illegal immigrant who cannot be deported because, and I am not making this up, he had a pet cat." Under other measures the private and family lives of citizens have also been curtailed. Rules introduced under May to restrict immigration mean that half of the women in the UK have lost their right to live in the UK with a foreign spouse because they do not earn over the economic threshold of £18,600. Bourdieu famously said that Sociology is a martial art. Researching the lives of migrants and refugees in the UK feels like we are fighting a war with no arms. For Theresa May’s Go Home Office has proven itself to be particularly immune to evidence. The ‘Go Home’ vans have been shown to have fostered more fear and distrust than reassurance among even the most anti-immigrant voters; the ‘hostile environment’ has increased racism, and done all but nothing to deter would-be fellow citizens from seeking sanctuary on our shores. Meanwhile, while all other European countries have heeded the evidence that indefinite detention is ineffective, exorbitantly expensive and causes severe suffering and harm, the UK continues to expand its estate. Yes, often our research falls on doggedly deaf ears. Theresa May boasted in the launch of her leadership campaign yesterday that she had flown to Jordan to seek guarantees that radical cleric Abu Qatarda would not face torture. But her well-oiled deportation regime means that there are no such guarantees for young men like Ahmed. The UK will make no record of Ahmed’s suicide because it didn’t happen on British soil; but rather – we believe – once the plane touched down in the war-torn landscape of Afghanistan’s capital. The UK government does nothing to monitor the fate of returnees or deportees, though external evidence reveals that some deportees to Sri Lanka have faced torture and that hundreds of those returned to the war zones of Afghanistan and Iraq face no choice upon arrival but to re-migrate at great risk. Unlike the dozens of migrants and refused asylum seekers who have taken their lives in detention centres at alarming rates in recent years, Ahmed spent the night on the phone to a volunteer at a local charity who tried to calmly talk him through his fears. We need to hold onto this love that May seeks to police. Otherwise in May’s “One Nation” we will all be border guards; and her vision of the Big Society will make us all shrink. *The individuals’ names have been changed to protect anonymity. This article was first published in July 2016.